Dr. Paul Casey offers a variety of advanced refractive treatments that can correct a range of vision problems. He is renowned as one of the most experienced LASIK Las Vegas surgeons, and he also specializes in LASEK and PRK. Dr. Casey offers Visian ICLs for patients who desire to achieve freedom from glasses but cannot undergo LASIK in Las Vegas, Nevada. Other procedures offered by Dr. Casey include presbyopia treament, cataract surgery and treatment of a range of common eye conditions, such as dry eye, strabismus and glaucoma. 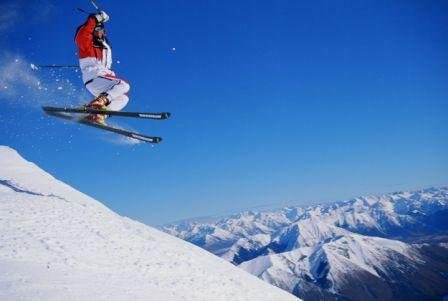 Dr. Paul Casey is offering $1000 off all-laser LASIK surgery eye surgery. Hurry offer expires December 31, 2013.
you feel like you have a new set of eyes! also don't forget that you can use your Flex Dollars on this promotion. · State-of-the-art facility with the most advanced technology. · We offer safe, precise vision correction for every prescription. · Dr. Casey and his staff are highly trained and very experienced. · We customize the technology used for each prescription. · We are not a discount LASIK center with circulating monthly coupons, but we do offer payment plans to fit LASIK into your budget. 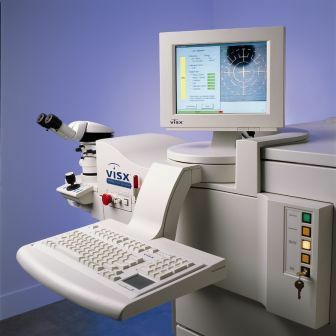 · We offer FREE all-laser LASIK evaluations! Find out if you qualify for LASIK today. Call Dr. Casey 702-423-1277 or email to schedule your consultation. We look forward to meeting you and answering all your questions. We welcome the opportunity to meet your vision correction goals.Vision correction surgery, such as LASIK in Las Vegas, is a life changing event. It allows you to be free from the hassle of glasses and contact lenses, and participate in activities like never before. Today, our laser eye surgery Las Vegas patients have more choices than ever before to achieve the lifestyles they desire. When you visit our office, your eye health is our top priority. Our entire team is dedicated to providing you with the personalized care you deserve using only the latest, most innovative techniques in eye care. We offer a variety of refractive surgery and general ophthalmology treatments to help restore and maintain your optimal vision health. As a leading Las Vegas and Henderson LASIK surgeon, Dr. Paul Casey has expertise in virtually all major vision correction procedures available today, including CustomVue LASIK, Staar Visian ICLs implantation, Near Vision CK and all three of the presbyopia correcting IOLs: the ReStor Apodized Diffractive IOLs, the ReZoom Multifocal IOLs and Crystalens Vision Enhancement System. about the various treatments that are available today. laser eye surgery under Nevada LASIK and Las Vegas LASIK. 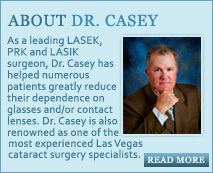 He is proud of his reputation as a highly regarded LASIK, LASEK, presbyopia treatment and cataract surgery Las Vegas specialist. During cataract surgery, Dr. Casey carefully removes patients’ clouded lenses and replaces them with intraocular lens implants (IOLs), such as ReStor, ReZoom, Crystalens or Tecnis. Las Vegas Ophthalmologist Dr. Paul Casey is dedicated to superior care such as Nevada LASIK, laser refractive surgery, conditions & treatments, and general eye care.